We are not meant to live life alone. One auther noted that the Bedouins in the Middle East, even though living in a desert without modern conveniences, average living beyond the age of 100. Israel researched the "why" and came up with two reasons: The Bedouins eat a very healthy diet and, second, they have no stress in their lives. Why no stress? They live so close together that they help carry each other when the struggles of the day come forth. When some gets sick, there are people there to carry them. When someone is hurting, there are friends that comfort you. When kids want to play, they are never alone. Some of the leading architects note that the "more gathering places one has", the stronger the community ties. So, when planning our urban areas, gathering places, gathering places, gathering places. Your blog talks about great spaces for kids -- that's right. 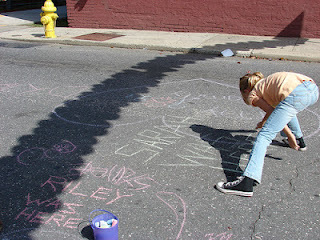 Being intentional about creating great gathering places -- will strengthen the community. No matter where you are: the more open space the better. Creative play; events; impromptu gatherings . . .
On the topic of gathering spaces . 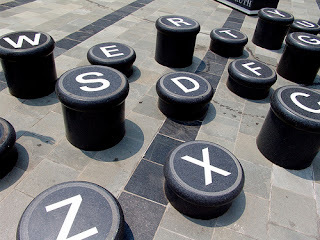 . . below are photos of the delightful public gathering spaces our family discovered on a summer trip to Asheville, North Carolina. This city has some of the most inviting kid-friendly public spaces of any U.S. city we have visited. One of the highlights is Pritchard Park, which is brimming with activities throughout the day and night. This park is probably the only place in the country where you can find women in pearls sitting next to hippies in tie dye jamming out in a drum circle every Friday night in the summer. Asheville, recognizing the importance of public gathering spaces like Pritchard Park, adopted a goal in its 2009 Downtown Plan of locating parks at 2 1/2 minute walking intervals throughout its downtown. 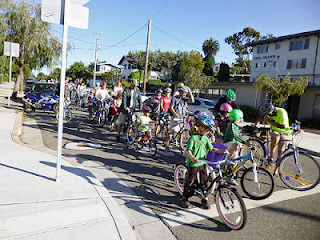 There are all sorts of fabulous blogs out there on cycling around cities with kids. One of my favorites is Family Ride, which features a family traveling around Seattle with two small children. 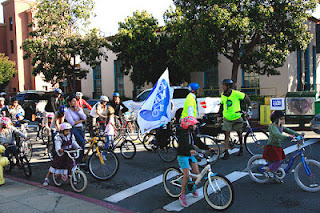 Today I came across a great site for Kidical Mass, which started in 2008 to promote family-friendly cycling in cities and towns through group rides. 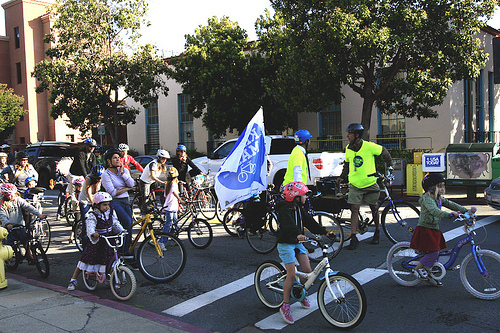 Chapters have sprouted up around the county, including Kidical Mass Seattle as well as chapters in Portland, San Diego, Chicago, Atlanta, Denver, and D.C. Surprisingly, no listing of a chapter in Austin. Today my 9-year-old son and I ventured out again on our bikes down South Lamar. We rode from the Walgreens down to Bicycle Sportshop on a patchwork of sidewalks and driveways. The route was an obstacle course that made Austin's Barton Creek greenbelt seem like a breeze to get through on a bike. Cycling with kids on South Lamar is NOT for the faint hearted. Austin's Newest Downtown Transformation: Places for Children? 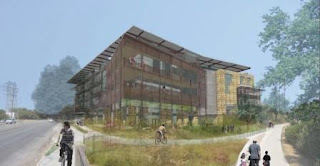 A ten-block area in downtown Austin is being transformed, with the development of a new $120 million downtown library, the Seaholm Power Plant redevelopment, and the Green Water Treatment Plant redevelopment (all on city land). I hope Austin parents will be asking city officials about the design of these spaces and how they can be made more family-friendly. With the new library, the area will surely be a huge magnet for families with children. Thanks to councilmembers Laura Morrison and Kathie Tovo, the library is including a special first-of-its-kind (for Austin) outdoor kid-friendly art sculpture for children to climb on. But what about the other outdoor spaces? For example, the Seaholm redevelopment will be including a large public plaza with restaurants and gathering spaces. Will families with children be able to enjoy these spaces? Will there be spaces for children to explore and play? When these public places come to life will they include the youngest members of our community? Inspiration can be found from other cities. For example, I love seeing what Charlotte, North Carolina has done with its downtown ImaginOn children's library and theater, producing events that spill onto the surrounding downtown streets--including this Wordplay event where kids take over the streets with chalk in hand.